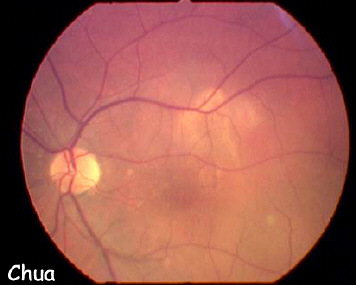 History: This 74 year-old with a history of bilateral dry age-related macular degeneration presented with a 2-week history of increased right visual distortion. The visual acuity was 6/18. Fundoscopy revealed areas of macular elevation near the fovea. 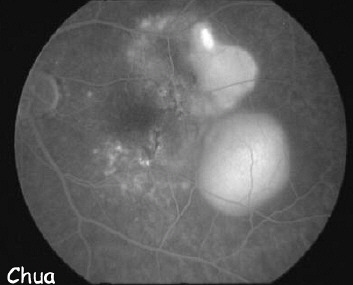 Fluorescein angiogram revealed two areas of pigment epithelium detachments. No treatment was performed. The pigment epithelium detachment resolved spontaneously and the vision returned to 6/12. However, one year later, the patient presented to the casualty with a sudden deterioration of vision. The vision was 6/CF. 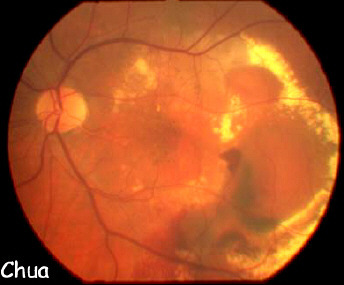 The fundoscopy showed circinate exudate with subretinal haemorrhage (caused by subretinal neovascular membrane). Fortunately, the left eye continued to have good vision. Initial presentation with visual distortion.